We mostly use our Smartphone for entertainment purpose, which includes gaming, Videos, Music, etc. In most of the website, we don’t get download option for any live videos. But what if we need those videos. So to download videos, there are many Video Downloader Apps available, but most of them are not good enough. But there are some Apps which are good and can download videos from most of the Video Platform. Here we are going to write about 5 Best Video Downloader for Android to Download Videos. You can download videos from a various platform like Youtube, Facebook, Instagram, Hotstar, Voot, TVF and more. You can also choose the quality of the Video in which you want to download. The procedure is simple as watching Videos. It is the best Video Downloader available for Android. You can not find it in Play Store, so to download the App follow the Link given below. The App has simple and user-friendly Interface. It allows to download videos from Youtube, Facebook, Instagram, Hotstar, Voot, TVF, SonyLiv, Dailymotion, Vimeo, Twitter, Vine, and many other video Platforms. In Videoder you don’t need to access any website, most of the platform is embedded with the App. But if you want to download from any site that is not embedded you can search in Videoder. It also has the powerful downloader which downloads video from more than one connection like IDM. It is available for both Android and iOS devices. TubeMate also has a large collection of Video platforms from where you can Download Videos. It is mostly used for Downloading YouTube Videos. You can just copy a link from Facebook, Twitter, Instagram, youtube and search on TubeMate and tap on download icon. You can download videos from YouTube, DailyMotion, Vimeo, Instagram, Facebook, Kakao TV, LeTV, Youku and more. It is easy to control and download Videos. Remeber to download videos you need to have Mp3 Converter; it will alert when it’s needed. KeepVid allows downloading all videos from a playlist with just one click. You can download any video in all the available Resolution. It also supports downloading videos from many sites. Along with Video, you can also download Mp3 files. It is not Available on Playstore, but the Lite version is available. So if you want to download videos from Facebook, Instagram and Vimeo you can install Lite Version from Play Store. Snaptube is also a great App to Download Videos from many Video Websites. The Interface of Snaptube is similar to KeepVid. You can download Video as well as Mp3 files from various sites. SnapTube supports downloading from Youtube, Facebook, Instagram, Vevo, DailyMotion, Twitter, Vuclip, etc. Vidmate is the HD video downloader from many popular sites. It is like a Video Store where everything is arranged perfectly. From categories, you can easily choose videos that you want to watch. You can download videos from Youtube, DailyMotion, Vimeo, Facebook, Instagram, Yodesi, Playit, etc. 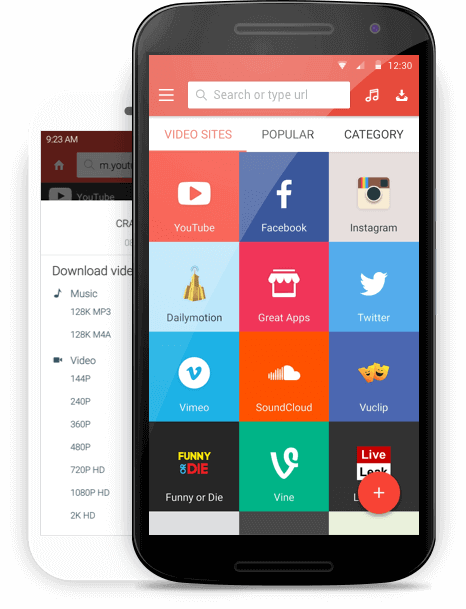 You have read 5 Best Video Downloader for Android to Download Videos. Stay connected to YTECHB for latest Tech News, Android & iOS Tricks, Telecom News, Accessories, Mobile Reviews and much more. Like our page on Facebook, Follow us on Twitter, and Subscribe our channel on YouTube @YTECHB. If you have any questions regarding 5 Best Video Downloader for Android to Download Videos, ask by using #YTECHB in the comment section. Nice bro, Thanks for sharing.